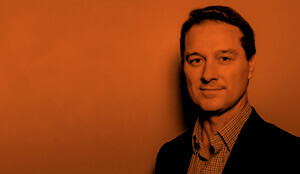 Most Australian investors know that the Australian equity market is top heavy with financial and resources stocks. As a result, if either of these important industries is performing well, there is a decent chance that the Australian equity market will be performing well too. Meanwhile, however, the Australian equity market is under-represented in one of the most vibrant industries in the world – technology. This note provides a case for why Australian investors may wish to diversify their equity exposure into the US tech sector, such as through the NASDAQ-100 index. As seen in the chart above, America’s NASDAQ-100 has strongly outperformed the Australian and US equity markets in recent years – even during the global financial crisis of 2008. Between end-March 2007 and end-April 2015, for example, the NASDAQ-100 (which contains around 63% exposure to tech stocks), lifted by 136% in price terms, compared with only 41% for the US S&P 500 index, and a 6% decline in the Australian S&P/ASX 200 index. The NASDAQ-100 has enjoyed relatively steady trend outperformance against these markets for the past eight years. The strong performance of the NASDAQ-100 has naturally led to concerns that valuations of this market may now be getting stretched. Indeed, many investors probably still remember the “dotcom bubble” of 15 years ago, which pushed US tech price to earnings (PE) valuations to ludicrously high levels. Investors may have noticed that the index level of the NASDAQ-100 has recently surpassed the levels achieved during the dotcom bubble, to be now at all-time record highs. With prices at highs, why buy now? As seen in the chart below, the rise in NASDAQ-100 prices since the dotcom bubble has been largely underpinned by strong growth in earnings by companies within the index. 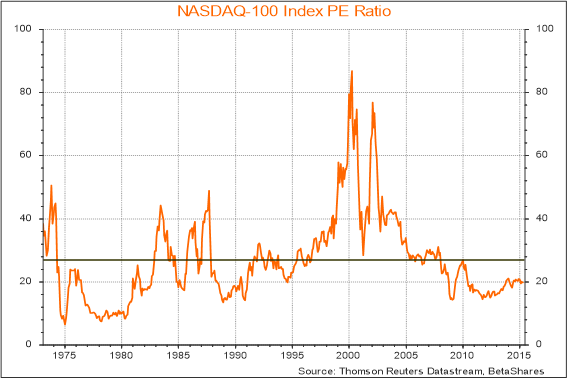 Indeed, NASDAQ-100 PE valuations are much less stretched than during the infamous bubble period. While NASDAQ-100 sector earnings did rise during the dotcom period, this was far outstripped by a meteoric rise in prices – pushing the PE ratio to a peak of 89 at end-March 2000. 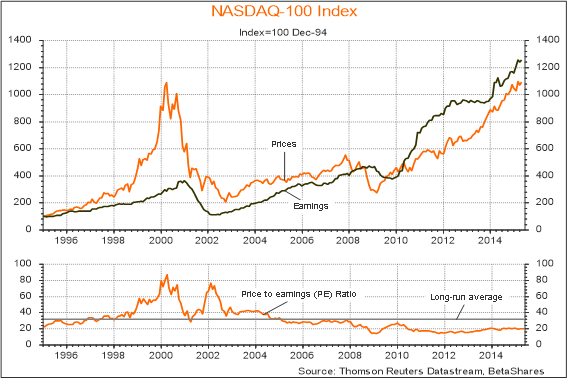 By comparison, as calculated by Thomson Reuters, the NASDAQ-100 PE ratio touched a low of 14.4 in September 2011, and has since steadily lifted to 20.0 times earnings as at end-April 2015. Note over the twenty tears since 1995, the Nasdaq PE ratio has averaged 32. And even if we exclude the bubble period (i.e. excluding months in which the PE ratio was above 40), the average since 1995 is 25.4. In other words, even after making some allowance for bubble valuations earlier last decade, the NASDAQ-100 PE valuation as at end-April was still a little below its long-run average. Note, moreover, that US interest rates are currently much lower than their long-run average– so relative to interest rates, the US tech sector is even cheaper than what has been portrayed above. From an even longer-run perspective, while it is apparent that the NASDAQ-100 is prone to bubble periods – the chart below suggests we are far from such a situation at present. Since the early 1970s, the NASDAQ-100 has had three bubble periods – which we define as when the PE valuations push above 40. The long-run average PE ratio over this period has been 26.9 – and excluding months when the PE ratio was above 40, the average is 22.8. On this basis – and especially given today’s exceptionally low interest rates – current valuations do not appear stretched. Another important factor for Australian investors to consider is that the NASDAQ-100 provides good exposure to one of the most dynamic global sectors – technology – that is very under-represented in the Australian market. As seen in the table above, the technology sector accounts for a large 63% share of the NASDAQ-100, compared to just over 1% for the S&P/ASX 200 index. 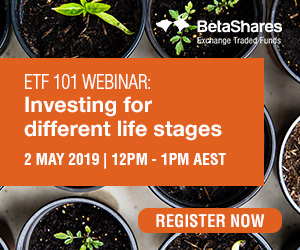 The NASDAQ-100 contains no financial stocks, and hardly any materials stocks – sectors which are both heavily represented in the Australian market. Compared to the S&P/ASX 200 index, the NASDAQ-100 also provides greater exposure to consumer discretionary and health care stocks. Last, but not least, exposure to the NASDAQ-100 on an unhedged basis also provides exposure to further potential gains in the US dollar versus the Australian dollar. At around US 78c, the Australian dollar is still considered “overvalued” by many economists, and even the Reserve Bank of Australia. Based on Treasury’s latest Budget time projections, Australia’s terms of trade are expected to fall further over the next two years, before levelling out at a level still above its long-run average. Even if this “above average” terms of trade forecast holds – which is still questionable – long-run valuation metrics suggest fair value for the $A would now be closer to around $US70c. 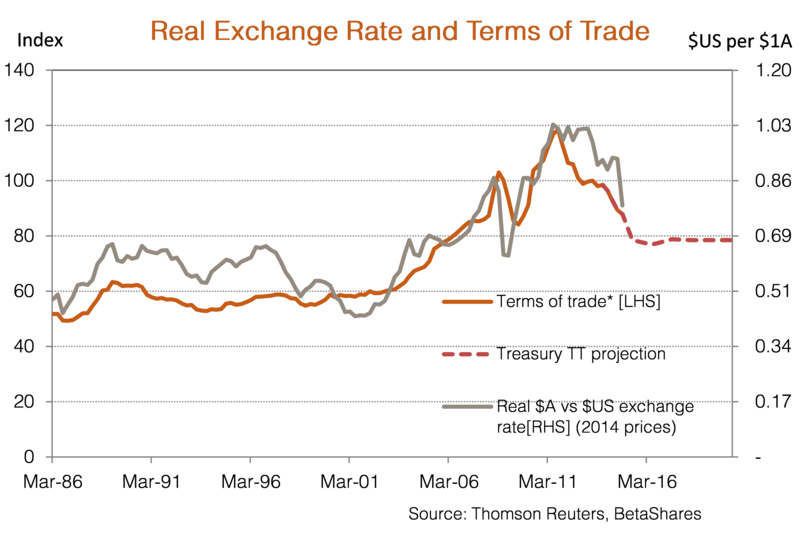 Another potential negative for the Australian dollar is relative interest rates. With the United States Federal Reserve expected to begin raising official interest rates in coming months, and the Reserve Bank of Australia still with a strong bias to cut interest rates further – the short-term interest rate differential between Australia and the US is expected to narrow further this year. In turn, this would reduce the interest-rate attractiveness of $A investments for offshore investors, adding downward pressure on the $A. Indeed, BetaShares’ long-held view is that the $A will decline to around US68c by year end – which would imply a 14.5% currency gain alone for Australian investors that seek exposure to unhedged $US based investments. Australian investors now have simple access to the NASDAQ-100 Index via the recently launched BetaShares NASDAQ 100 ETF (ASX code: NDQ). NDQ aims to track the NASDAQ 100 Index before fees and expenses and can be bought and sold like any share on the ASX. NDQ thus gives investors access to the fast-growing technology sector without having to buy ETFs on exchanges outside of Australia. Nasdaq®, OMX®, Nasdaq-100®, and Nasdaq-100 Index®, are registered trademarks of The NASDAQ OMX Group, Inc. (which with its affiliates is referred to as the “Corporations”) and are licensed for use by BetaShares. The Fund has not been passed on by the Corporations as to their legality or suitability. The Fund is not issued, endorsed, sold, or promoted by the Corporations. The Corporations make no warranties and bear no liability with respect to the Fund. Bassanese’s Market Insights: Should we fear Fed tightening?